People tend to think superpowers only consist of flying, laser vision, superhuman strength... you know.... your average "super" stuff. But there's so much more! For example, drummers have excellent superpowers. They keep everyone else on time and bring rhythm to just about everything in life. If that's not "super", we don't know what is. 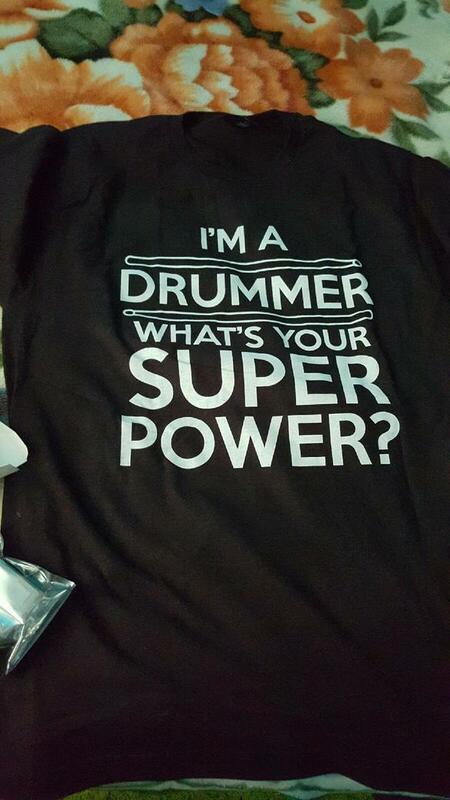 Show off your awesome superpowers with this design and open the world's eyes to the amazing power of drummers! Excellent service as always thanks! For my brother...he loves it! I bought this shirt for my adult son who plays drums for a local band. He wore it in a recent performance and stood up at the end of the set and took off his jacket to reveal the T-shirt underneath and the crowd went wild. Looks great and fits great. My only consern is the material wich is 100% cotton, hope they don't shrink even if it says pre shrunk. As for the rest the printing is great,the size is exacly like the chart and the shipping was on time. Happy costumer! !